St. Omer is a northern French city in the department of Pas-de-Calais. The city and its cathedral share the name and the patrimony of the saint who brought Christianity into the place. There are two organs in this cathedral: the main organ on the western gallery, and a small chancel organ. 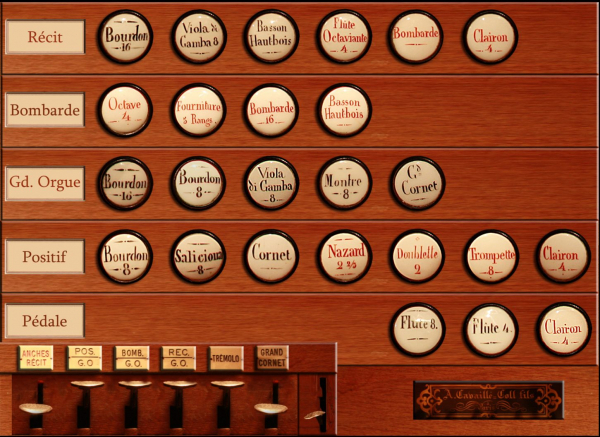 The virtual instrument presented on these pages is based on the recording of the large instrument which was originally built by brothers Thomas and Jean-Jacques Desfontaines in 1717. It had 45 stops. The highly decorated organ case is a masterpiece by several members of the family of sculptors, painters and carpenters Piette and Baligand. This organ case is indeed exceptional and it provoked admiration from the time of the creation until today. Aristide Cavaillé-Coll said it was one of the most remarkable organ cases ever. Likewise, he highly praised the quality the instrumental part of this organ when inspecting it in 1852 before the restauration. However, he found out, that the time, use, later changes and mutilations of the instrument caused such a deterioration, that the instrument must be restored completely. 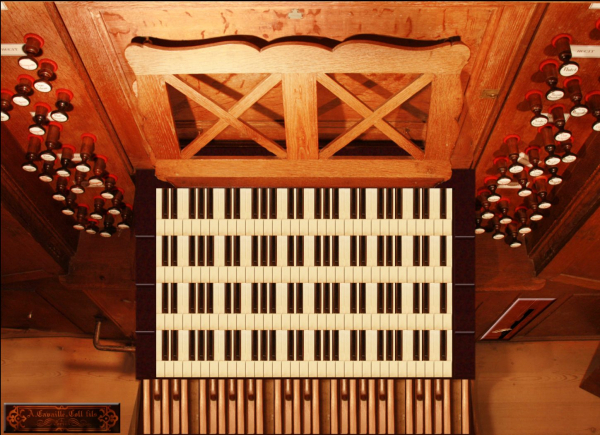 He proposed "to bring this organ back the first position it occupied among the instruments of its century." 4 new stops for Pedale: Flute 16, Bombarde 16, Trompette 8, Clairon 4. 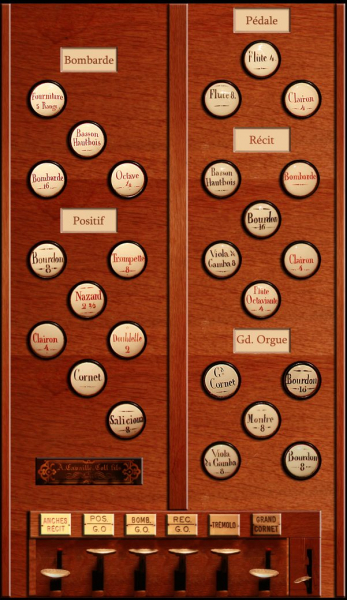 The organ was originally pitched in a "French" tone which was a full tone lower than the normal pitch of the late 19th century. 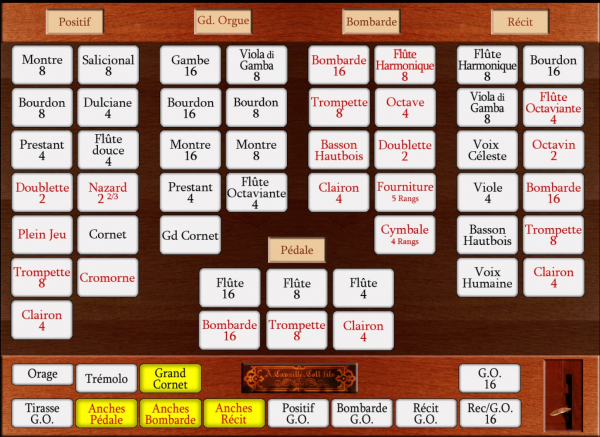 Cavaillé-Coll therefore rised the pitch of the instrument to the standard of the day. The rebuilding of the organ was finished on October 14th, 1855. 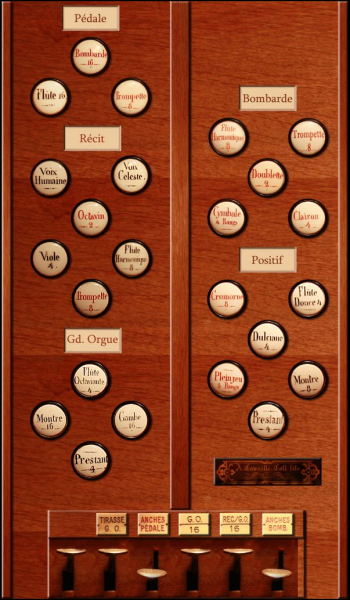 The inauguration of the organ took place on June 24th, 1855, by Louis-James Lefébure-Wély, organist of the St. Sulpice church (Paris). 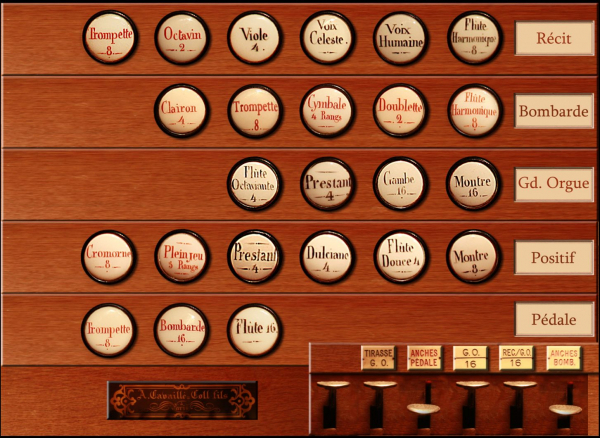 St. Omer large organ is therefore to be classified as still a relatively "young" Cavaillé-Coll instrument of the transitional type. 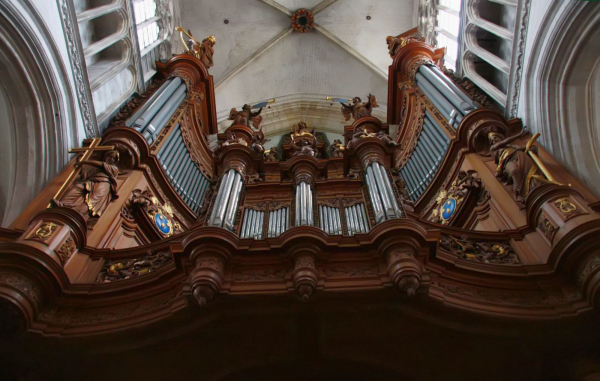 The instrument is undoubtedly heading towards the symphonic style in design, voicing, technical means, but it still bears unmistakable signs of the baroque organ sound ideal, because the organbuilder reused a large portion of the previous pipe material. Therefore, it differs greatly in sound from - to give an example - the Caen instrument which is also available in the Sonus Paradisi collection. The Positif is played from the lowest keyboard, and it is the division where one recognizes rather traditional baroque composition. 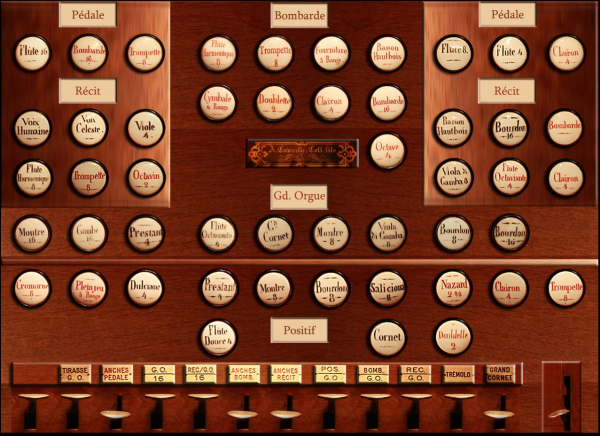 The Grand Orgue is divided onto two manuals. The Fonds (the base stops) occupy the second keyboard, while the aliquote stops and the reeds are placed on the third manual (Bombarde). Coupled together, the division is complete. This design still echoes the fashion of the French 18th century Raisonance division; one of these can be met in the St. Maximin sample sets which is also available in the Sonus Paradisi collection. Also the Pedal is very conservative in composition. The symphonic trend manifests itself fully in the Récit expressif which is played from the top most keyboard. 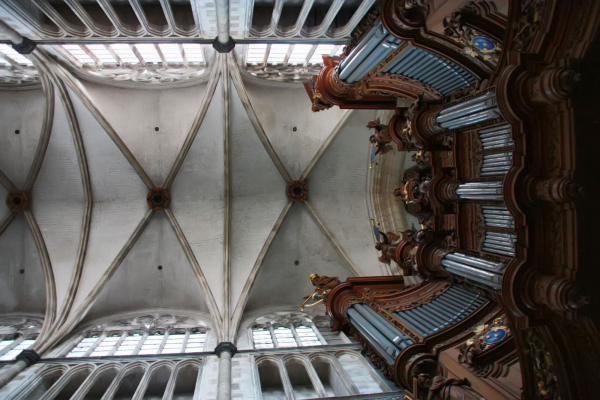 The instrumental part of the organ was classified as a historical monument in 1973. 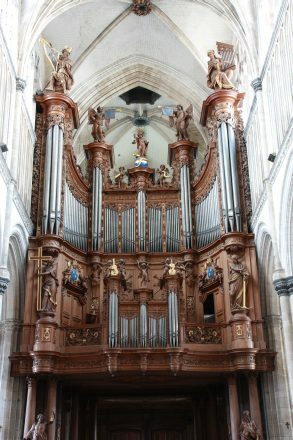 The restoration of the organ was done by Haerpfer in 1985-88. The samples are offered in 48kHz/24bit resolution. The multiple releases have three levels: short, mid and long. Hauptwerk v4.0 and higher supported for the Organ Definition File. The sample set is encrypted, which means that it can be used with Hauptwerk Basic or Hauptwerk Advanced versions exclusively. Hauptwerk Advanced version is strongly recommended, the Basic version is not suitable to run the Surround variant of the sample set (memory limitations, audio channels limitations). There is no use of the sample set possible in any other software. 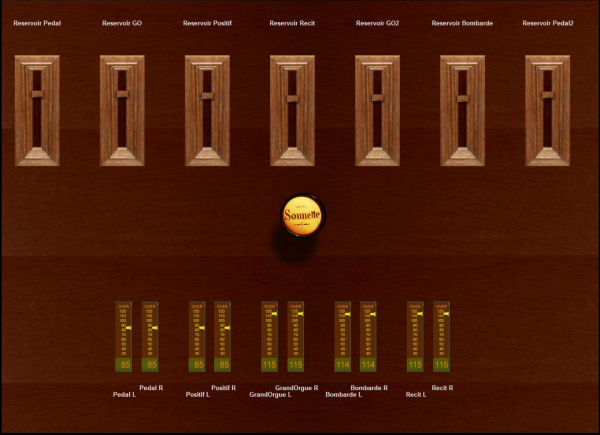 The sample set is offered in the Surround variant (4 channels). The routing of the front and rear audio channels is demonstrated in the blog post. The reverb time is about 4-5 seconds. The original compass of the keyboards is 54 keys (up to the high f). The original compass of the pedal division is 27 sounding tones, although the pedalboard is extended to 30 keys, the high keys serve for the pedal coupler. The Hauptwerk model extends the pedal division to 30 sounding tones. Polyphony of 6000 voices recommended for the full suround. There are sampled tremulant ranks for many stops. For the less critical stops, Hauptwerk tremulant model is used, but improved by the proprietary Sonus Paradisi method (dual channel tremulant model): the tremulant model affects differently the left and the right channels of the samples, thus achieving better results. The red marked stops with (a) are put in function by pressing the corresponding Anches pedal. Couplers: Pos - G.O., Réc - G.O., Réc. - G.O. 16', Bom. - G. O., G.O. 16' (pulls also suboctaves of all the other manuals coupled to G.O. ), G.O. - Ped. Appels (ventils): Cornet (G.O. ), Pédale, Récit, Bombarde. St. Omer, Surround, version1.02 update. - several pedal releases adjusted. Make the artificial - real tremulants selectable on per stop basis. Priority: very low.